Good morning! Today I’m taking part in a fall home tour hosted by Marty from A Stroll Thru Life, if you’re stopping by from Clean & Scentsible, welcome! 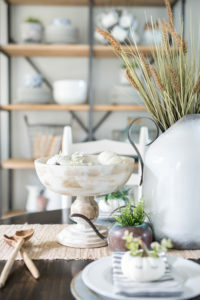 Wasn’t Jen’s fall kitchen gorgeous"
When summer starts to transition to fall, I definitely feel the need to switch things up and make things feel more fall-like in our home. However, I always feel reluctant to go “all-out” fall at first. It’s like I’m not quite ready to leave summer, but ready to dip my toes into fall…and that is exactly how I would describe my dining room right now; the “dipping my toes into fall” dining room. When one is dipping one’s toes into fall, they’re careful to not use brightly colored leaves, but some neutral wheat that whispers fall instead. No orange or red either, just some mixing of metals and pops of greenery, thank you. …and simple sleepy white pumpkin plant creatures hint just enough at the season to come. Oh don’t you worry, there will be plenty of time to decorate more obviously for fall very soon…but for now, let’s just let fall ease it’s way in.